Original Antique Maps and Prints. Antique Map-FRANCE-PICARDIE-De L’Isle-1710. 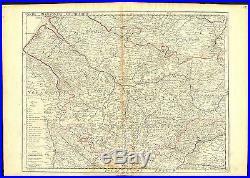 Description: This antique map was published ca. Artists and Engravers: The de L’Isle family was one of the most influential Geographers of the early 18th century in France. Claude de L’Isle, born 1644, had four sons, of which Guillaume was the most notable. Guillaume was born 1675 and became member of the’Academie Royale des Sciences’ with the age of twenty-seven, and was honoured later with the title’Premier Geographe du Roi’. His largest project, the’Atlas de Geographie’, was published until 1774 in Paris and Amsterdam (Covens and Mortier). He died in 1726. Map engraved by Joan van Lugtenburg. Subject: Map:’Partie meridionale de Picardie dressee sur les operations geometriques de Mrs. Lesperson & de Rousseville et sur plusieurs autres memoires Par Guillaume Del’isle de l’Academie Royale des Sciences. Detailed map of the Picardie region in northern France. Urban areas in color. 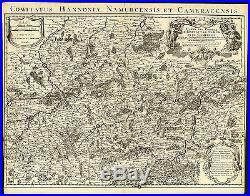 Shows forests, Roman roads, churches, abbeys by religious order, priories, etc. A few small tears bottom margin, not or hardly affecting image. Damp stained at the bottom; brown discoloration. Vertical crease right of middle fold. Please study scan carefully. Size (in cm): The overall size is ca. 74 x 52 cm. The image size is ca. 63 x 48 cm. Size (in inch): The overall size is ca. 29.1 x 20.5 inch. 24.8 x 18.9 inch. Medium: Engraving / etching on a verge type of hand-laid paper. Original old outline hand colouring. ThePrintsCollector – Laurentius Old Master Prints Peter Cornelissen, Frans Laurentius, Joost Bos Margo van Latum-van Dongen, Frank van Latum Located in Zeeland (Noord-Brabant) – The Netherlands. GO TO OUR STORE and explore our huge collection of fine antique maps and prints. FIND SIMILAR ITEMS IN OUR STORE. Visit our Store: we would like to invite you to review similar items in our Store or to browse through all other items in our Store. We are confident that you will find very special unique antique maps and prints in our Store. It is our privilege to have you as a customer. The item “Antique Map-FRANCE-PICARDIE-De L’Isle-1710″ is in sale since Thursday, December 10, 2015. This item is in the category “Antiques\Maps, Atlases & Globes\Europe Maps”. The seller is “theprintscollector” and is located in Zeeland. This item can be shipped worldwide.